We’ve made a splash with the opening of our fantastic NEW Leisure Pool – book a short break or holiday for all the family and come and have a cracking time. With a 48m interactive fun slide, racer slides, themed splash zone and more – we’ll keep you all entertained. Why not set challenges with each other and see who in your group can race down our flume the fastest? After all that egg-cercise you might fancy a Papa John’s Pizza Store and Takeaway to share, or pop to the SPAR and treat the winner to something chocolatey! We love our Woodland Trail and feel so lucky to be located in the heart of over 100 acres of beautiful Lancashire countryside so as a special treat for the Easter break, we’ve put a fun activity into the forest for everyone to enjoy. Simply pop to Holiday Guest Reception, then get those muddy boots on and all head out in the fresh air. Crack open the large wooden eggs, answer the questions hidden inside and then head back to reception for your prize! That Lancashire air is just the best! Hide and Seek – Where’s Dizzy? Dizzy Duck, our beloved mascot is playing a game of Hide and Seek here at Ribby! Gather your friends and family, get out in the fresh air and see if you can spot her. She moves all the time, so you’ll need to keep your eyes peeled. 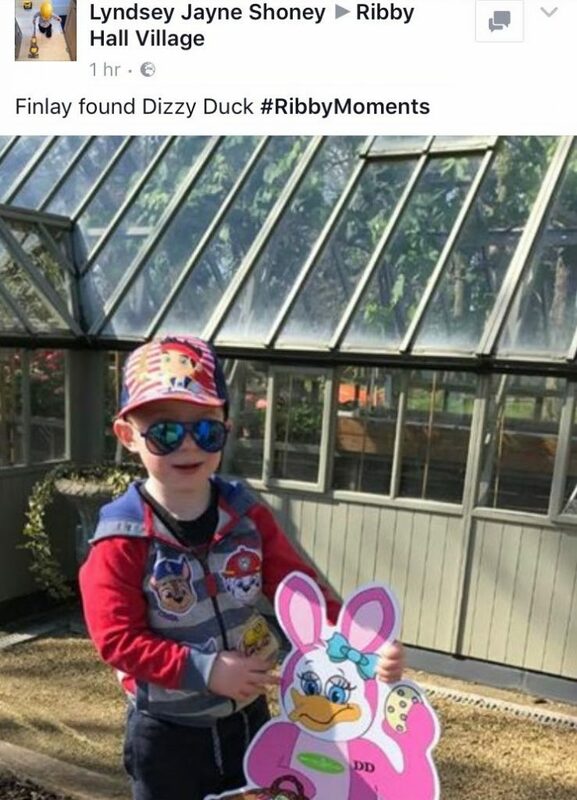 Post your photos on social media with #RibbyMoments so that we can see your Easter snaps. You may even win your very own Dizzy Duck soft toy for taking part! Can’t wait til then? Dizzy Duck and Cyril the Squirrel can also be purchased from the SPAR on The Village! Once you’ve found her, why not play some games of your own. You could try Hide and Seek too or take a wander around the Woodland Trail and play an old fashioned game of I Spy! We love retro games like that! Feeling fit? You could even set little exercise challenges on your way round The Village! Dizzy Duck has gone loco for Easter and lost her eggs! She’d hidden them from cheeky Cyril the Squirrel to stop him eating them! Pop along to the Bar and Grill and take part in one of our Easter Egg Hunts where you need to answer the clues to win the chocolate treats! Available on selected dates for Holiday Guests to take part in. You may even get to meet the Easter Bunny along the way… Don’t forget to dress for the Great British weather! Small charges apply. Ed Sheeran has been topping the charts, left, right and centre so we had to book a Tribute Act for Easter for guests! He’s live this Saturday (8th) in The Bar and Grill – so if you’re staying with us – then you’re in for a treat! If you haven’t booked yet? Why not! Come and sing along, you know the words! Other acts featuring include Little Mix Tributes (13th) and Justin Bieber (16th). Don’t be shy…check out what’s on here. Ribby Hall Village is a fantastic place to visit all year round but during school holidays, it becomes extra special. Visit ribbyhall.co.uk or call 0800 085 1717 to book. We have some great deals for Easter, with some last minute prices that are just egg-cellent. Don’t delay! Book today!